How to transfer iPhone contacts to computer without iTunes? Hi, I have an iPhone 5 and I use Exchange server account to sync my iPhone contacts with Google. I would also like to transfer my iPhone contacts to my computer (as a sort of an offline backup copy). I would rather not to use iTunes sync as it already deleted my old iPhone contacts once when I tried to transfer them to my Windows 8.1 computer. How is that possible? I have seen many iPhone users finding the solution about iPhone contact recovery on the internet, if you are able to transfer contacts to PC, then you won’t be afraid of such problem. 1 Sign in to Gmail. 2 Click Gmail at the top-left corner of your Gmail page, then choose Contacts. 3 From the More actions drop-down menu, select Export…. 4 Choose whether to export all contacts or only one group. 5 Select the format in which you’d like to export your contacts’ information. Please note, some of these formats can lose some contact information. – To transfer contacts between Google accounts, use the Google CSV format. This is the recommended way to back up your Google Contacts. – To transfer contacts to Outlook, Yahoo! Mail, Hotmail, or various other apps, use the Outlook CSV format. – To transfer contacts to Apple Address Book, use the vCard format. 7 Choose Save to Disk then click OK.
8 Select a location to save your file, and click OK.
iPhone Data Recovery not only is a recovery tool but also can transfer iPhone data to computer. 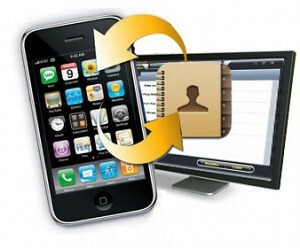 Here I will introduce how to use iPhone data recovery program to transfer iPhone contacts in a few words. # Launch iPhone tool and the program will identify your backup files automatically. # Choosing the backup files of you, click “Start Scan” to scan all the contacts on your iPhone. # Preview the scan files after the scanning. # The last step is check the contacts you need to transfer to computer, click “Recover”. Way three: Transfer iPhone contacts with iPhone data transfer tool like Tenorshare iPhone 5 Transfer. For Mac users, you can transfer iPhone contacts to Mac by using iPhone Data Recovery for Mac versions. This entry was posted in Tips for iPhone Contacts and tagged transfer contacts from iPhone to computer, transfer contacts from iPhone to pc, transfer iPhone contacts to Mac, transfer iPhone to computer on June 7, 2013 by Jack.